Sarah is the Chief Information Officer (CIO) at Bruce Power. She has global experience in many industries and executive roles spanning business consulting, complex multi-stakeholder program management, operations, P&L, sales, customer relationship management and product management. 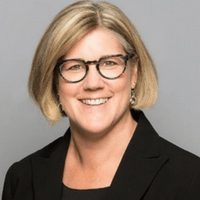 Before joining Bruce Power in 2013, Sarah was a VP at BlackBerry, responsible for strategy, planning, procurement, process improvement and business continuity across four of RIM’s operating units. Sarah also spent over a decade with IBM in leadership roles such as project and program management; outsourcing; business transformation / process re-engineering; and strategy consulting. Sarah began her career with Union Gas where she held a variety of engineering and management roles in the areas of regional operations and pipeline construction. She holds a Bachelor of Engineering Science degree, Mechanical, from the University of Western Ontario. Sarah sits on the Board of Governors for the University of Western Ontario, the Digital Advisory Board to the CIO Branch of the Treasury Board of Canada, and is the Chair of the CIO Committee at the Conference Board of Canada. Sarah recently completed a term on the Board of the Natural Sciences and Engineering Research Council (NSERC).